Lists. I love 'em. Really, I truly do. They make things so much easier. And the pure JOY one gets from checking items off a long to-do list is just FABULOUS! Fabulous, I tell you. For reals, though. Sooo...when Joscie came up with the idea for these AMAZEBALLS stamps, I was one hundred percent on board. Umm... yeah. So, here's the deal. There are two versions of this amazing stamp available at Bossy Joscie. The one shown above, where you can add any name or description you like in the box... like say.... Santa's nice list, My to-do list, Honey-do list, etc.... OR, she has a personalized one available that I needed. NEEDED, I tell you! Are you seeing that? Do you SEE how perfectly that fits on a sticky note? Yup. That was on purpose. 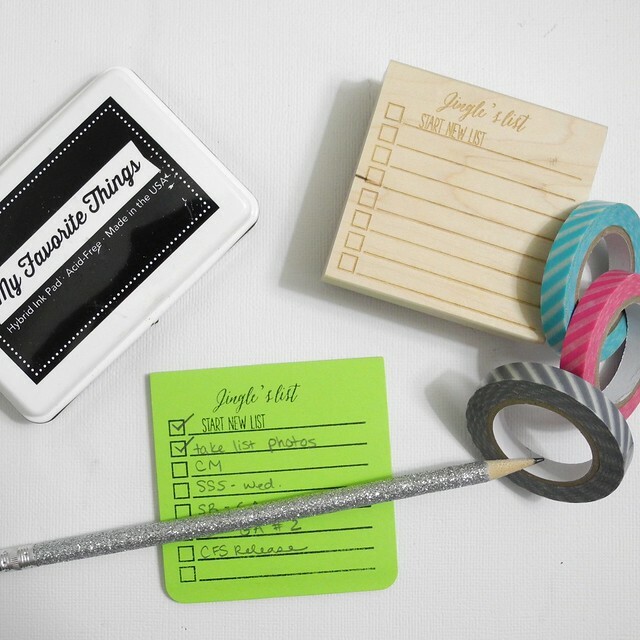 You can stamp this fabulous list onto a sticky note AND, not only do you have a super cute, ready to go list, BUT WAIT! THERE'S MORE! Yes, my friends, you also get to check off the first item on your list right away because... you did it! You started a new list! Congratulations! I am telling you, folks, this was some pretty genius design work on this one. For reals. Also, if you haven't checked out Bossy Joscie, you simply must. MUST, I tell you! There you will find a wide selection of gorgeous custom stamp options and flair, both custom and ready to ship! Wanting to buy an awesome list stamp for Christmas? There are a few of the non-personalized ones in stock and ready to ship. If you would like a personalized one, Joscie will happily print out a card showing the awesome stamp that is in progress so you can stuff that stocking with a fun surprise! Head on over to check it out. Seriously, though. You know you want to. I love this list stamp! I just ordered a personalized address stamp for my brother and sister-in-law. It's a perfect new home gift! 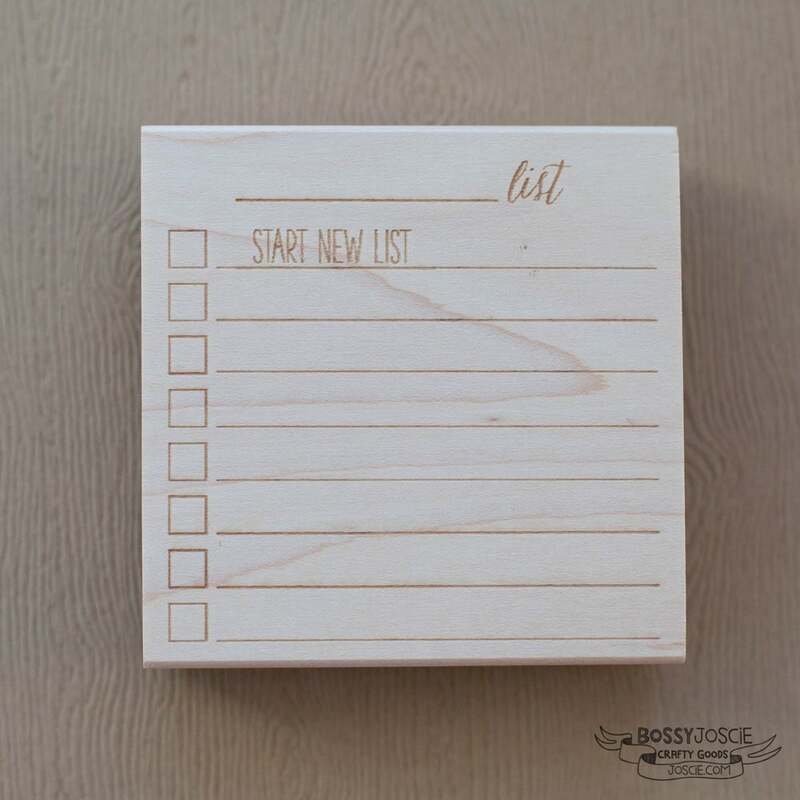 This list stamp is awesome and I love the start new list is already on there! :) tfs! I was just loving crossing some things off my lists earlier today lol. That is an awesome stamp. I think it would be awesome for scrapbooking and cards too. (I love multipurpose stamps). oooh I think I'm in love. What a super duper cute stamp. Thanks for sharing! These are perfect! MWAH! A Brand New CAS-ual Fridays Stamps Release! A Very Chickaniddy New Year! Thinking of You and a Winner!